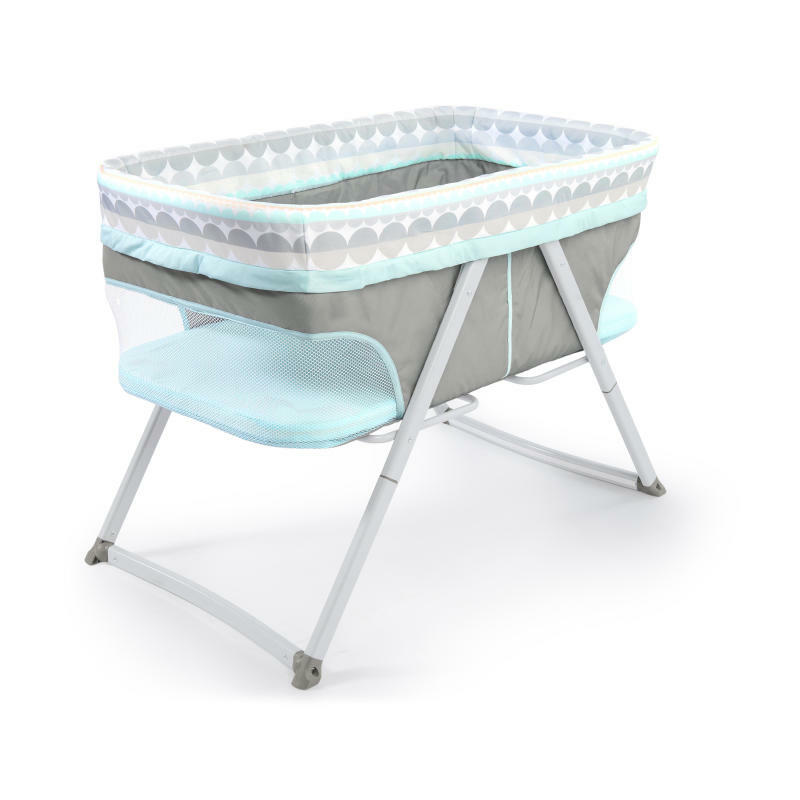 FoldAway Rocking Bassinet – Juniper is rated 4.4 out of 5 by 52. Designed with parenthood in mind.™ This lightweight sleeper from Ingenuity makes for peaceful sleep, even on-the-go. Take baby’s favorite place to sleep on the go with this highly portable, rocking bassinet. The FoldAway Rocking Bassinet™ a cinch to set up: it pops into place in seconds, and folds back up with one step for transport or storage. Its rocking feet can be used to gently soothe baby, or converted to stationary mode for night time sleep. At either end of the bassinet are breathable mesh panels, which help improve air flow, keep baby comfortable, and keep baby in sight so both mom and baby can rest easier. The contemporary and fresh colors of the Juniper fashion is sure to compliment the décor of most homes and is perfect for baby girl or boy. Mattress size = 17.5" x 33.5"
Dimension (in) 38" x 21" x 27"
Bassinet fabrics and Mattress: machine wash with cold water. Air dry flat. Rated 1 out of 5 by Shalena from Really disappointed We got this bassinet as a gift from our baby shower that we registered for. I am extremely upset after washing the mattress pad cover AS THE instructions said and it got completely ruined in the washer!! Torn at the seams and absolutely unrepairable. I contacted the company 12 days ago, explaining that my baby is going to be here in a couple weeks. Which is now turned to any day now!! I still haven't heard from anyone about sending the replacement part & there is absolutely no way to just purchase the replacement myself as they don't sell it!! No fitted sheets to even cover the mattress!! So I am left with a bassinet that is completely useless with days before my baby is to arrive. So, he will have nothing to sleep in unless we go and purchase an entire new bassinet. I am not only upset with the product, but I am so disappointed with this company and how they have handled things with not communicating at all knowing our situation. I would not recommend this product or even the company for that matter. I will change my review should they decide to handle the situation differently. Rated 1 out of 5 by Alex098 from 3 times use it, and broken We’re disappointed. On the 3th time after two months it was broken. Who created this gear ?!!! Rated 1 out of 5 by Alex098 from 3 times use it, and broken We're disappointed. On the 3th time after two months it was broken. Who created this gear ?!!! Rated 5 out of 5 by mickeyismyhomeboy from SO easy to set up, lovely addition to any room This bassinet is light and easy to set up. The portability means we can take it from room to room quickly and easily. It is beautiful to look at as well, which means I love having it near me when baby is sleeping no matter where I am. Rated 4 out of 5 by Kim1234 from I like it 98% - but no sheets and no girl colors I think its very nice. Easy to put together too. Its not too big but big enough for a long baby. I put it on my registry and received it as a gift. I use it downstairs due to stitches. I can't always put the baby upstairs for naps. This is nice and small/medium size and goes into the guest bedroom which is where I will be until stitches heal. The downside is there are no sheets, but from what I understand, sheets can be a safety hazard and cause SIDS if not fitted to the bassinet. so if the manufacture could provide a thick winter sheet ie velvet or flannel, it would be nice. but in the summer I see no need for that at all. the wipe-able base is all I need for those oops moments and I"m ecstatic about being able to wipe it down. In the mean time a swaddle and a wearable blanket is all the baby needs for colder climates. Especially for preventing SIDS. This is great. Only other downside are the colors. It could have something other than blue. Rated 2 out of 5 by AnnieB from Don't buy if you want to use a fitted sheet! There are NO fitted sheets available anywhere that fit this size and shape of bassinet. I've searched every possible corner of the Internet and have failed to find a fitted sheet that will work. They don't mention the deminsions of the actual bassinet mattress pad anywhere on this website or the packaging so we had to measure it ourselves and that is when it discovered it was going to be a challenge. If I had known it would be this difficult to find a corresponding fitted sheet I would not have bought this bassinet.